Birding apps for Costa Rica have now been around for several years, and this post revisits the birding applications (“apps”) dedicated to Costa Rica’s rich bird life that I reviewed in March 2013: Costa Rica Birds Field Guide and BirdSounds Costa Rica. Both apps are now available for Android devices as well as Apple mobile devices—iPhone, iPod Touch, and iPad. Another app, BirdsEye Costa Rica, has also become available since my first review. 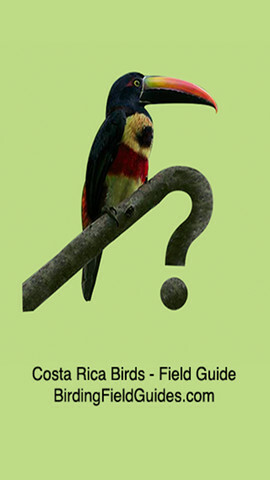 Costa Rica Birds Field Guide, published by Birding Field Guides. $14.99 for full version, $2.99 for Basic version for Apple iOS 8.0 or later for iPhone, iPod Touch, or iPad. $9.99 for full version, $2.99 for Basic version for Android 2.3.3 and later. Size: 405 MB (full version); 206 MB (Basic). This app became available in January of 2012 in the iTunes Store, and is now also available on Google Play. It has steadily been improved as the publishers continue to add species, photos, and sounds. It considers itself the first digital field guide completely focused on birds that are seen in Costa Rica. (The publisher also has an app for the birds of Panama.) Michael Mullin, head of programming for Birding Field Guides, expects this app to make it easier for eco-tourists and birders of all levels of experience to identify and learn about Costa Rican birds with images, range maps, and text for more than 890 species. Vocalizations of more than 660 bird species are also included along with a search filter and other features. The latest full version now seems appropriate for serious birders as well as more casual bird enthusiast visitors to Costa Rica. Photographs for more than 890 species. Range map for each bird. Description, including field marks and habitat for each bird. Bird sounds for around 660 species. New “Similar Species” feature allows quick comparison of field sightings. Place for personal notes, recording GPS position, and ability to email notes. Ability to access device’s camera and photos from within the app. My take: Based on my use of the app on my iPhone, I find the data included in the app quite well organized and easy to navigate, with the search functions comprehensive and pretty intuitive; and the latest version of the app is very comprehensive, enough to be a digital substitute for a paper guide, especially if you’re only a visitor to Costa Rica. BirdSounds Costa Rica, published by Bernard Geling/BirdingApps (they don’t yet have a new website up and running as of this writing). $19.99 for full version, free for Lite version; requires Apple iOS 5.1 or later for iPhone, iPod Touch, or iPad. The same price for the full version (and free for Lite) on Android 2.3.3 and later. Size: 1.02 GB for the full version, slightly less for Android version; 69.5 MB for the Lite version. This app became available in January of 2013 in the iTunes Store, and is now also available for Android devices on Google Play. This app is dedicated exclusively to an extensive collection of bird sound recordings: there are no bird photos, range maps, or other data about the birds covered. According to the publisher, BirdSounds of Costa Rica is “the perfect complement to your paper field guide to the birds of Costa Rica;” however, the most recent version of the Costa Rica Birds Field Guide app reviewed above has bird sounds for about 660 species, so some might not feel this is as essential as it once was. All of the sounds are included in the app, so there is no need to connect to the internet to access sounds or other content. This is why the full version of the app is in the hefty 1 GB range. More than 2000 recordings for 764 species of birds found in Costa Rica, a pretty high percentage of the species found here, leaving about 80-90 species unrecorded. (The Lite version covers 133 recordings for only 30 species, clearly a teaser version.) There are multiple recordings for most birds. Several playback modes, including ability to automatically repeat a single track or all of the tracks for a species. There are no annoying voice-overs identifying the bird or track number. Extensive search options, including browsing by Group (for example, Tinamous, Pigeons & Doves; Parrots & Parakeets), by first or last name of the bird, or by typing in any part of a bird or species name. A customizable list of favorite species for quick access. A list of the 20 most recently accessed species. Information behind most of the recordings, including where and when the recording was made and by whom. My take: I’ve found the bird sounds included in the app of good quality, quite comprehensive and easy to access. The automatic repeat playback mode is really handy if you’re in the field and want to play the bird sound several times in succession without having to resort to the controls. While there are still about 10% of Costa Rica’s bird species not yet included, this is an app worth considering as an audio complement to your bird guidebook; however, now that the Costa Rica Birds Field Guide app reviewed above has bird sounds for about 660 species, this app might be less compelling. BirdsEye Costa Rica, published by Birds in The Hand. $9.99 for Apple iOS 7.0 or later; Size: 13.4 MB. This app became available in May 2014, after my initial review of Costa Rica birding apps, and I hasten to add at the outset that I have not yet used this app for reasons I’ll mention below. A “free” app for Android 4.1 and later–BirdsEye Bird Finding Guide–purports to do much the same thing but to also cover birding “around the world”; but “in-app purchases” ranging from $0.99 to $79.99 mean the actual cost for Costa Rica use isn’t clear. One of the key features of this app seems to be access to the eBird data base that could give you “up to the minute” updates on species seen in your location. (The app is described as being “powered by eBird,” and all purchases of the BirdsEye app helps support the Cornell Laboratory of Ornithology, a good thing!) For all practical purposes, this requires that you to have a cellular data internet connection, something not that reliable in many birding areas and certainly not practical for most casual visitors to Costa Rica who don’t sign up for a cellular data plan during their visit. The description of the app also mentions the requirement to sign up for a free Birds in the Hand account in order to take advantage of some customization features (personal bird lists, etc.) and an optional $4.99 monthly BirdsEye Membership “to unlock all the media available in the app for each bird (new photos and updates available daily)” and other search and bird list features. It’s somewhat unclear if this membership requirement applies for access to the basic “media” (especially photos) for the app or only new media, whatever that might mean. My take. Because the more straightforward Costa Rica Birds Field Guide app reviewed above requires no internet connection to use in the field (only to download from the relevant app store), I am not inclined to pursue this app further. However, if anyone reading this has used this app in Costa Rica, I’d welcome your thoughts. It’s certainly possible that by not personally trying the app, I’m not doing it justice here. Some last thoughts. In 2013, shortly after I wrote my initial review of these apps, I ran into Robert Dean, co-author of Garriques & Dean’s The Birds of Costa Rica: A Field Guide, and he confirmed that an app based on this popular field guide is underway. One of his goals is that the app be as complete digitally as his field guide is in the print media, with the addition of other features such as bird sounds, photos, and access options that digital guides can so readily provide. Presumably, such an app will also include Robert Dean’s wonderful bird illustrations. I suspect that when this app eventually appears–and as of this writing, it still hasn’t–it will likely become the best Costa Rica bird app available. This entry was posted in Viewpoints and tagged app, birding, mobile devices by hhull3. Bookmark the permalink.